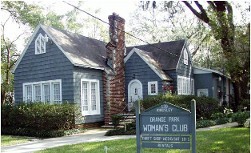 The Orange Park Woman's Club is conveniently located in Orange Park, Florida, and it's a great place for your next event. Fully remodeled in 2010, property enhancements included: 4 chandeliers on dimmers, fire place extension, six pillared columns, concrete stained and polished dance floor, new carpeting, crown molding, fresh paint, new drapery, and recovered arched cornice boards. We've even received rave reviews from event coordinators, caterers, bands, DJs, event planners, and florists. Contact Betty Murphy at 904-269-4041 if you have questions or would like to see the space. 2 stoves to be used for warming only. Household size refrigerator with small ice maker. Plenty of counter space, including prep island.